Mihai Eminescu is considered Europe's last great romantic not in the least because he gave voice of such unmistakable music to the sadness of love. The "Luceafarul" (Evening Star) by Mihai Eminescu, a 98 stanzas long poem about the impossible love between immortal Evening Star and a beautiful mortal princess sets the world record for the Longest Love Poem. The Legend of the Evening Star ("Luceafarul") is a story about a young princess who prayed to the evening star each night. The evening star falls in love with her and is willing to give up his immortality, but realizes that the pure love he has for the young girl cannot be sustained in the mortal world. The 100+ yrs old linden tree from the "Copou Park" of Iasi where the poet Mihai Eminescu use to get his inspiration, also known as "The Lovers Tree" has become a favorite destination for true romantic lovers from around the world. Tourists from all the world-as far as Japan or Brazil- are coming here and kissing nearby the tree-which is supposed to bring good luck in love. 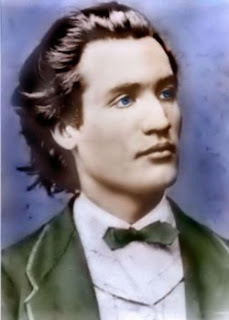 *** Mihai Eminescu was also declared "UNESCO-Year-2000-Poet-Of-The-Year".